Home» Window » How to take a Screenshot in Windows PC easily? How to take a Screenshot in Windows PC easily? Hello Friends In this post of today you will know How to take screenshot in windows pc ,Screenshots are a very simple way to capture the background or part of a backpage or computer screen, you can also take screenshots in your phone and tablet, taking a screenshot is a very simple process, yet many users still have many types of You download the software but you do not have to download any other software to take a screenshot. You can easily take screenshots of your computer and laptop screen . You must use all the computers. You will need to take a screenshot of it when you do any online work. If you still can not understand what the screenshot is? So get the idea of taking photos of the online page you are currently on. They also used without camera. It's called Screenshot. All people doing online work use screenshots in Windows. You may have to take screenshot even in Smartphone - Mobile. In this article, there are several ways to describe screenshots on windows 7, 8, 10. With this you can easily take a computer screenshot. How To Lock A Folder With A Password Using Notepad? 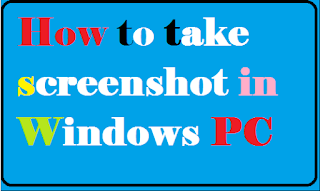 How to Capture a Screenshot in Windows PC with the Help of Snipping Tool? Step1; First of all, open the Start menu and type the Snapping Tool. Step2; After that you will get the snapping tool in the first option. Click on the snipping tool. Step3; The snapping tool will open before you click on it. Step4; After clicking on New, and whatever screenshot you want to take, select the help of space mouse. Step5; After selecting, you will have a new dialog open which will show you the screen shot of the selected area. Step6; You can now save the screenshot easily. How to capture screenshot with the help of Windows key? Friends, taking a screenshot from the help of windows key is very easy, if you are using windows 8 / 8.1 / 10 then you can easily capture screenshots with the help of windows key. You have to follow some easy steps. Step1; Press the "Print Screen" button with your Windows button in your PC or laptop. Step2; You will see a dim light in your pc for a few seconds. Step3; Your screenshot is captured. Step4; Now you can find your screenshot in this Pc> Pictures> Screenshots. How to take a screenshot with the help of lightshot software? Online Immediately, taking the screenshot of any part of any web page is the easiest and easy way to do lightshot. This is a software. It has to be downloaded and installed. You can also use it without installing - Install Browser Add - Ons, extensions. The advantage of this is that you can take a screenshot without opening any program - software or app. Not only that, you can also take screenshots and edit images. This is the best way to take fast screenshot. Step1; First of all you can download the LIGHTSHOT software, you can download this software free from the internet. The download link is given below. Step2; Download this software to your PC or Laptop and install it. Step3; Now, after pressing the button of Prnt Scan, the Lightshot software will become active. Step4; Now select the place from the arrow as much as you have to take a screenshot. Step5; Now you can use Ctrl S or Ctrl C to save those screenshots. If pressed Ctrl S, then Screenshot will save the Lightshot folder in the computer's document.